The newly-named Republic of North Macedonia has today signed up to become NATO's latest member. 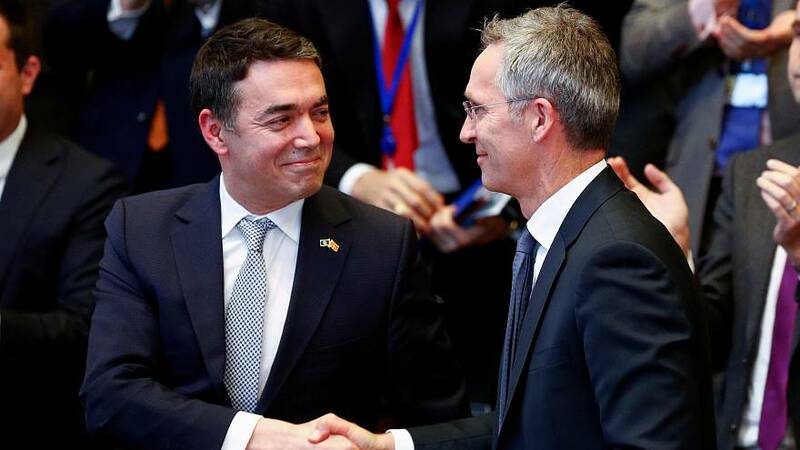 Nikola Dimitrov, the country's foreign minister, signed an accession pact paving the way for the Balkan nation to join the defence alliance. Skopje called it a historic day, while NATO Secretary General Jens Stoltenberg said it was good for the region and Euro-Atlantic security. READ: How does a country get invited into NATO? The move comes after the Macedonian Parliament voted to change the country’s name last month from FYR Macedonia to the Republic of North Macedonia, settling a long-standing dispute with Greece. FYR Macedonia was controversial for Greeks because it used the same name as a neighbouring region in northern Greece. "This is a journey that has made us more mature... we have proven that we can assume our responsibility, face a problem, and resolve those problems," Dimitrov said at a news conference Tuesday after the signing ceremony. The signature of the NATO accession pact does not mark the end of the journey just yet. The enlargement of the alliance now has to be ratified by the national parliaments of the 29 NATO member states, Stoltenberg said, adding that he did not anticipate any problems. In the meantime, Skopje will already have a seat at NATO’s table. "From today, your country will participate in NATO meetings as an invitee”, Stoltenberg told Dimitrov. This will include the Leaders meeting next in December in London, which will mark NATO’s 70th anniversary.